Eaton Corp. Has Bought Back Over Half a Billion Dollars of Stock So Far in 2016. Should Investors Be Happy? Is this the best use of its cash today? Global industrial giant Eaton Corp. (NYSE:ETN) has been busy buying back stock in 2016. So far this year it's spent nearly $570 million -- 25% more than last year. Should investors be happy with the way management is using its cash? Eaton Corp. stock has been on something of run lately, advancing around 45% since mid-January. You wouldn't be wrong to question if now is the best time for the company to be using its shareholders' cash to buy back stock -- only that isn't the full picture; shares are still nearly 15% lower than their recent peak in 2014. And at their mid-January nadir, they were over 35% below their 2014 highs. So it isn't like Eaton has been buying its stock at record-high prices. 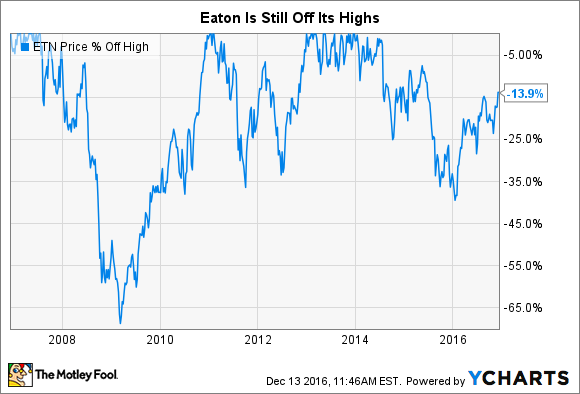 And while recent stock prices are less advantageous than what it was able to get from Mr. Market earlier, it's hard to suggest that Eaton is wasting money, as it's reduced its share count by roughly 2.5% over the last nine months. That said, share repurchases don't occur in a vacuum. Is this the best use of Eaton's cash flow? Eaton has been struggling with weak end markets, as have most of its industrial peers. The company's organic sales declined 3% in the third quarter, continuing a trend that's been going on all year. At this point it expects full-year organic sales to be off 4% or so. That's in line with peers like Emerson Electric (NYSE:EMR), which saw underlying sales from continuing operations decline 7% in fiscal year 2016, which ended in September. It's an industrywide trend. So Eaton has been working hard to adjust to the current market. That's meant spending on restructuring. The cost there is projected to be around $145 million in 2016, which is expected to pull around $200 million out of the company's cost structure. That's a good use of cash, but the company can only do so much restructuring at any given time and, frankly, should only trim what needs to be trimmed. Basically, it should avoid cutting too deeply since the historically cyclical industrial sector will, eventually, bounce back. Eaton's 2016 restructuring costs. Image source: Eaton Corp. Which brings up the cash flow statement. Eaton generated around $1.9 billion from operating activities through the first nine months of 2016, up more than 17% year over year. Investing activities ate up $370 million of that, most of which was capital expenditures like plants and equipment. Dividends consumed $780 million. That left plenty of cash to do other things. But what? Eaton isn't on the prowl for big acquisitions today, since it only recently completed digesting its purchase of Cooper Industries -- the largest acquisition in the company's history. Bolt-on deals, which the company has been willing to undertake, tend to be small. After that, there's not a whole lot else other than debt reduction and buying back stock. With long-term debt at about a third of the capital structure and interest rates near historic lows, it doesn't make much sense to pay down debt. So the nearly $570 million Eaton has spent on share repurchases was well within its cash flow means, and there isn't a whole lot else it would spend its cash on during an industry downturn. And since increasing the dividend reduces financial flexibility over the long term if cash flows weaken for a spell, buying back stock looks, indeed, to have been a good call for the company and its shareholders.